AT&T’s 5G Evolution is not a 5G network – that was established when they first introduced it in 2017. That hasn’t stopped them from continuing to spread the word about their phones having access to “5G,” even if they are attempting to act like they aren’t doing something sneaky by putting an “E” logo on the end of related branding. Their 5GE plans have garnered criticism from competitors, including at least one lawsuit. 5GE is a non-stop joke to those of us who watch the wireless industry on a daily basis. But even as AT&T does this 5GE thing, while misleading customers with logos on devices, they are promoting it as a way to let customers know about recent network upgrades. 5G Evolution is LTE Advanced, so it technically is a decent upgrade over the original 4G LTE tech that your phones first connected to years ago. While I’d recommend they tell people that rather than use a logo for a network they aren’t accessing, I’m not sure AT&T cares much. That said, if AT&T feels so wonderful about the upgrades it has pushed to towers that it’s comfortable bending the truth, you’d hope that their network can at least deliver something spectacular when compared to competitors. Does it? 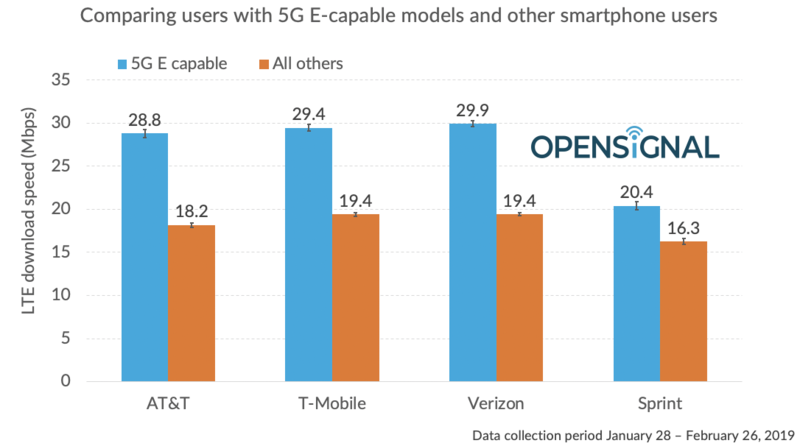 Well, the folks at OpenSignal ran a series of tests of AT&T’s 5G Evolution next to phones from T-Mobile, Verizon, and Sprint, and the results aren’t great for AT&T. In the chart below, the same phones from T-Mobile and Verizon top an AT&T 5GE phone. The speeds are close from all three carriers, but that’s not saying much for the carrier who put a “5G” logo in their customers’ face. Now, to be fair, AT&T isn’t claiming that 5G Evolution is 5G. At least that’s not what they are directly going to say. But they are putting a 5G logo on phones and in marketing materials, which is imprinting that idea, thought, and technology in the minds of its customers. They may not directly call 5GE a next-gen network, but they are certainly trying to suggest that whatever they are doing, it’s an improvement over competitors in the race to 5G. As you can see in the data above, that’s not even true.